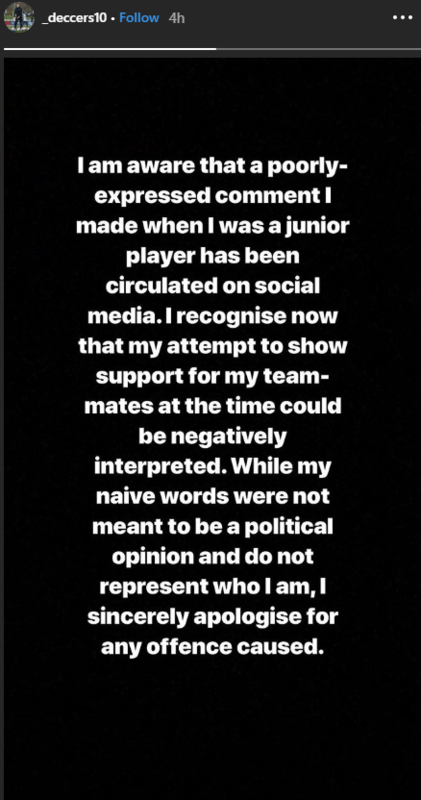 Rice moved swiftly to apologise once the old posts were circulated online, writing an Instagram story which read: "I am aware that a poorly-expressed comment I made when I was a junior player has been circulated on social media. "It won't affect anything in that respect (whether Rice plays or not). "He's fitted in really well with the team. He's looked excellent. There isn't a player that has been in the squad who I would hesitate to start in the game, so I am very confident in all of them." "That is the perils of social media for any of us with kids," he added. "You just don't know what that interaction might be. When they're socialising with friends, you're a bit braver in some of your comments or a bit less thoughtful in some of your comments, so I think for all young people that is a danger. "I think people understand. Most people will have children of those sorts of ages and people are still maturing at that age.